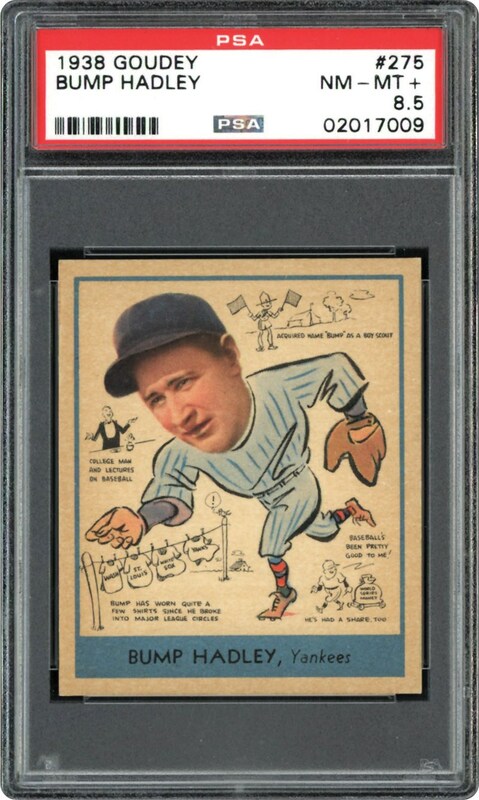 Lot # 123: 1938 Goudey “Heads-Up” #275 Bump Hadley (PSA 8.5 NM/MT+) - “1 of 2” & HIGHEST GRADED Example! 1938 Goudey "Heads-Up" #275 Bump Hadley (PSA NM/MT 8) - "1 of 2" & HIGHEST GRADED Example! 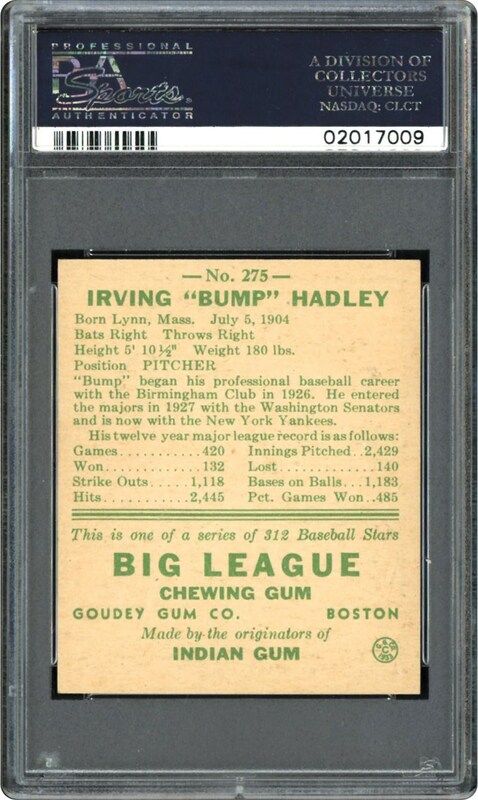 The finest of its kind, this miraculous PSA NM/MT+ 8.5 Bump Hadley '38 Goudey offering stands at the top of the PSA "Pop" chart with a single other specimen! Simply stated, '1 of 2" highest graded 1938 Goudeys don't surface often, with this hallowed assessment fully justified by the seemingly unparalleled eye appeal. The Yankees right-handed hurler never looked better with his brilliant central image depicting near "dead-on" 50/50 centering within the bold blue outer frame. A "Mint Looking' example, only a microscopic-like touching on the outermost right corner tip may have prevented this card from achieving the near-impossible "Mint" assessment. Yet, most would agree, the current NM/MT+ 8.5 pinnacle grade is more than sufficient for even the most meticulous hobbyist!